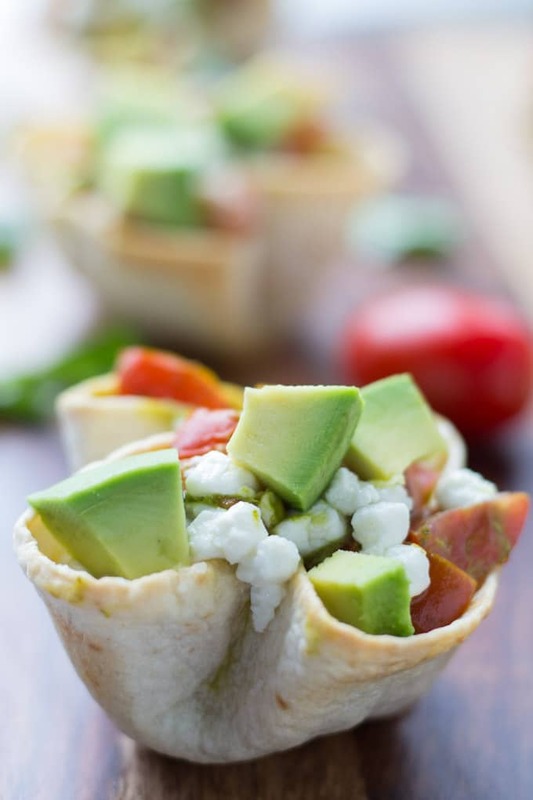 Goat cheese, avocado, tomatoes, feta, cilantro and basil all combined in mini tortilla bowls! This is a heavenly appetizer. Is that a category? If not, it should be. These Goat Cheese and Avocado Bruschetta Tortilla Bowls are perfect for backyard grillin’ and chillin’. Which means, you munch on these with a glass of wine while you wait for your husband to BBQ turkey burgers…AKA, cooking supper, as he puts it 😉 . When I was in Toronto a few weeks ago, I had the best bruschetta at this fantastic Italian restaurant. It was a goat cheese and avocado bruschetta served cold on slices of toasted Italian loaf. It was amazingly delicious. So when I got home, I was inspired to try a version of my own. But since I try to limit my bread intake (I love it, but my stomach doesn’t always love it 🙁 ), I thought I would try the bruschetta with tortillas. Turning them into mini bowls was my husband’s idea, and it was an awesome idea! The best part about this recipe is the cilantro basil dressing. Since I first made this a few weeks ago, I’ve been putting it on everything! The dressing consists of cilantro, basil, garlic, lemon juice, olive oil, salt and pepper, and it’s just blended together. The dressing is then poured over chopped tomatoes, goat and feta cheese, and additional chopped basil. 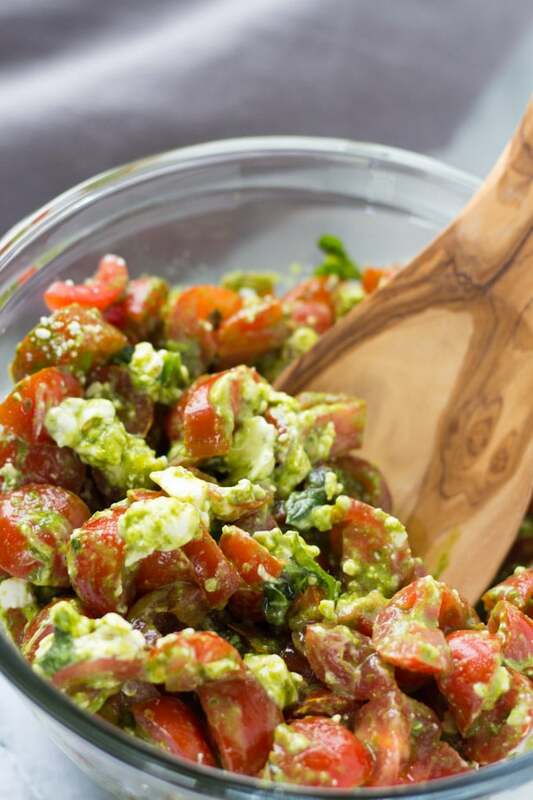 It’s marinated for a few hours, and voila, you have yourself a magic bruschetta mix that works well in baked tortilla bowls, but also on a salad, pizza or even with zucchini noodles. Yup, I’ve tried it all! For this Goat Cheese and Avocado Bruschetta Tortilla Bowls recipe, just bake the mini tortilla bowls ahead of time and serve this appetizer hot or cold. To serve hot, place a few teaspoons of the mixture in each bowl, sprinkle on some additional goat cheese and bake for five minutes. Add chopped avocado before serving. To serve cold, add a few teaspoons of the bruschetta mixture to each bowl and sprinkle additional goat cheese and avocado on top. Don’t add too much of the bruschetta liquid to the bowls as they may get soggy and they will be super messy! Okay, who really cares about getting messy?!?! The real reason not to use too much is that you want to have some left over to use with other meals! Remember…..salads, pizza, noodles 😉 . Here’s to lots of sunshine and summertime apps! As always, enjoy and let me know your thoughts in the comments below! 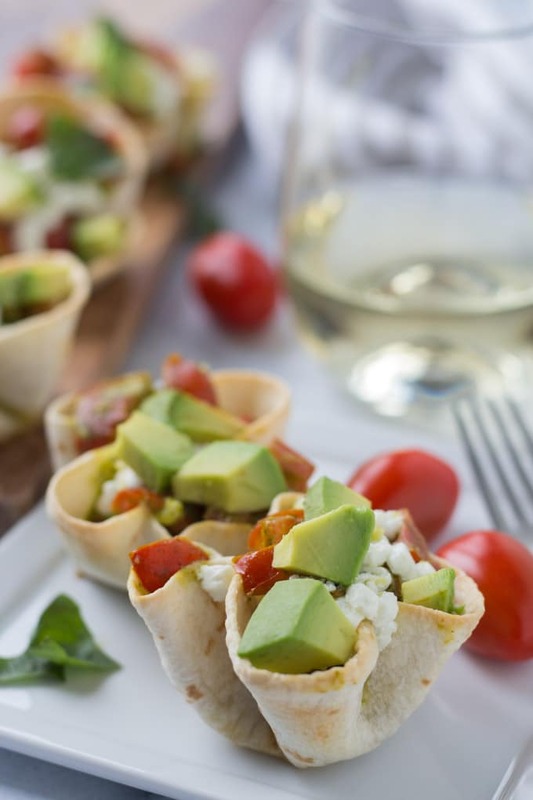 If you like quick, easy, prepare ahead appetizers, look no further than these Goat Cheese and Avocado Bruschetta Tortilla Bowls. 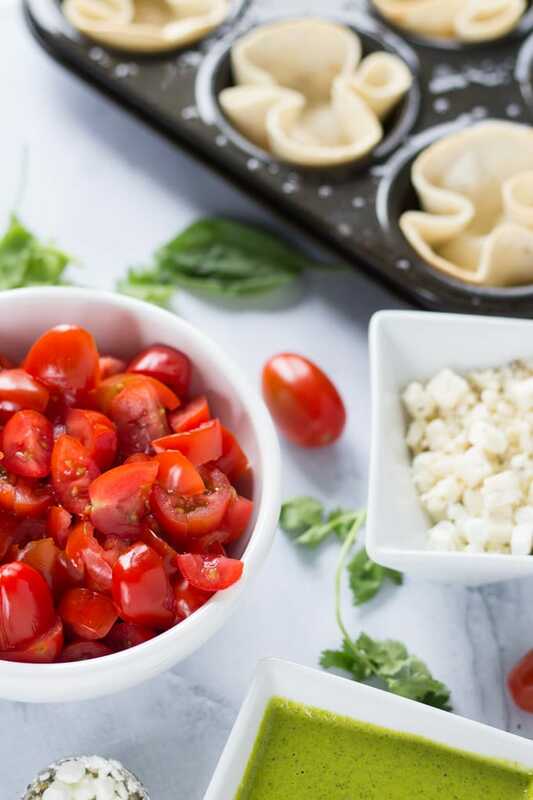 The tortilla bowls are perfectly bite sized, and the bruschetta mix is loaded with fresh tomatoes, goat cheese and avocado. Perhaps the best part is the cilantro basil dressing/marinade, which also works on salads, pizza and noodles! Add the cilantro, 1/4 cup of basil, olive oil, lemon juice, garlic, salt and pepper to a blender and blend on high for 30 seconds, or until the mixture has a somewhat smooth texture and dark green color. In a small bowl, add the tomatoes, and 2 tbsp. each of goat and feta cheese. 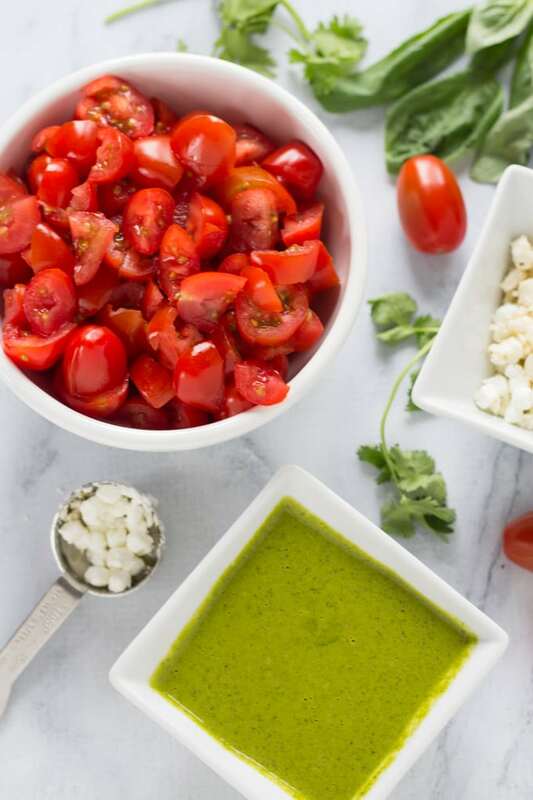 Pour the cilantro basil dressing over the tomatoes and cheese. Add remaining 2 tbsp of chopped basil. Stir to combine. Cover and marinate in the refrigerator for 2-3 hours. To make the mini tortilla bowls, pre-heat the oven to 350 degrees. Grease a 12-cup muffin pan and shape each tortilla into the cups. Spray each tortilla with a little bit of cooking spray and sprinkle with a dash of sea salt. Bake the tortillas for 10 minutes. Remove from oven. 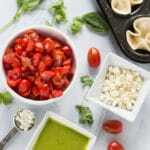 If serving cold, scoop a few teaspoons of the bruschetta mix into each mini tortilla bowl and top with the remaining 2 tbsp of goat cheese as well as the chopped avocado. If serving hot, scoop a few teaspoons of the bruschetta mix into each tortilla bowl and top with the additional goat cheese. Bake on 350 degrees for another 5 minutes or so. Remove from oven and add chopped avocado. Serve and enjoy! Store any leftovers in the refrigerator and consume within 1-2 days. I’m loving the goat cheese recipes! I can’t wait to try this one!! Thanks Susan. I’ve definitely been a bit obsessed with goat cheese lately :). This recipe is so delicious and easy! Let me know what you think when you try it.